This hymn is often called the "National Anthem of Christendom." 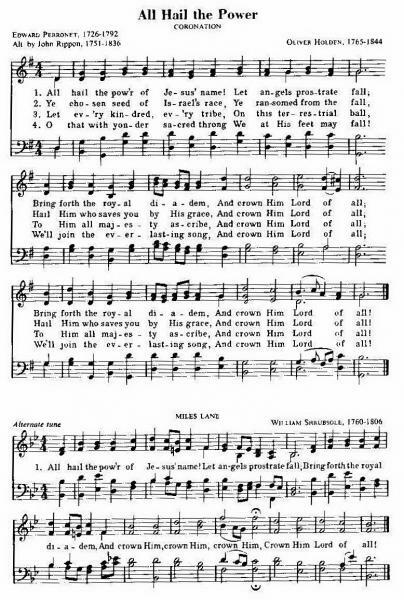 The hymn first appeared in the November, 1779, issue of the Gospel Magazine, edited by Augustus Toplady, author of "Rock of Ages" (No. 78). This text has been translated into almost every language where Christianity is known; and wherever it is sung, it communicates to the spiritual needs of human hearts. One writer has said, "So long as there are Christians on earth, it will continue to be sung; and after that, in heaven." Another interesting account regarding the relationship between the Wesleys and Perronet concerns the incident when John Wesley announced to a congregation that Edward Perronet would preach at the next service. Being eighteen years younger than Wesley, Perronet had always refused to preach in the elder statesman's presence. Desiring to avoid a public conflict with Wesley, Perronet mounted the pulpit but quickly explained that he had never consented to preach. "However," he added, "I shall deliver the greatest sermon that has ever been preached on earth." He then read the Sermon on the Mount and sat down without comment. Though Perronet wrote many other hymns and forms of poetry, most of which he published anonymously, this is his only work to survive. The success of this text has, no doubt, been furthered by three fine tunes. "Coronation," composed by Oliver Holden, a Massachusetts carpenter, self-taught musician and respected singing-school teacher, is most widely used in America. "Miles Lane" by William Shrubsole. Perronet's personal friend, is the most popular in Great Britain, while the festive "Diadem" tune, composed in 1838 for this text by James Ellor, an English layman, is frequently used as a choir number. Many interesting accounts have been associated with the use of this hymn. One of the most remarkable is a story told by E. P. Scott, a pioneer missionary to India. One day he was waylaid by a murderous band of tribesmen who were closing in on him with spears. On impulse the missionary took his violin out of his luggage and began to play and sing this hymn. When he reached the stanza "let every kindred, every tribe," he saw to his surprise every spear lowered and many of these tribesmen moved to tears. Scott spent the remaining years of his life preaching and ministering God's love and redemption to these people. God in His providence used a simple hymn as a means of introducing the gospel to a group of needy pagans.